Judging a book based on the author 's previous work is a risky matter that might also preclude a good reading. 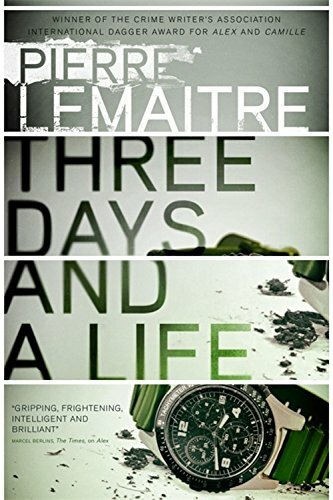 Definitely different from Lemaitre's famous psychological thrillers (like "Blood Wedding " to mention my favorite or the series of the Parisian Police Commander Camille Verhoeven) "Three Days and a Life" is a novel that is not easy to classify into the usual categories of crime fiction genre and probably doesn't even belongs to it. Barely 200 pages characterized by a strong psychological component and character development with a dash of noir. Beauval, a small village in Picardy, north of France. Christmas 1999. The twelve-year-old Antoine, the only son of separate parents, lives with his mother Blanche. He has as best friend Ulysses, the dog of Mr. Desment, who, badly injured after a car crash, is killed by his master and thrown into the rubbish, right in front of Antoine. Desperate and blinded by grief, Antoine will commit by accident a terrible crime that in just a few moments will mark his existence forever. Terrified by the idea of being discovered, the three days after the incident are filled with an indescribable anguish, horrible future scenarios and escape plots products of the mind of a terrified little boy. When it seems that there is no escape for him, the tables turn and Antoine starts to believe that he might, after all, get away with it. In "Three Days and a life" all the action is at the beginning of the book, wich in divided in two parts, the before and the after the incident. The close up on Antoine's childhood has definitelly more weight than the rest of the novel, as to stress the enormous impact that it will have on his whole life. The story develops in an angry and introspective account of the consequences of the crime and will lead, in the end, to a bittery conclusion. Totally different from Lemaitre's previous work ( and in my opinion of greater emotional depth) this book describes with superb mastery the atmosphere of the small french provincial town that has felt the shockwaves of a crime, oppressive and bigoted as the thoughts that incessantly follow Antoine. Skillfull writer, Lemaitre plays with words describing feelings and fears so fervently and realistically that are able to incept in the mind of those who read a thought: what if had happened to me? A dash of noir, very few dialogues and exceptional writing are the strong points of "Three Days and a Life" which cannot be classified in any of the typical categories of crime literature. More a drama and a character study rather than a noir, this book is not for everyone and will definitely fail to deliver the tipical tension of psychological thrillers and will be a sour delusion if you are expecting something similar to Blood Wedding. But is totally recommended if you are for great elegant prose and a thought-provoking story than provides painfull insides of what's on the other side the of an accidental crime, the devouring guilt and the overwhelming weight of lies. A good novel but simply not my Lemaitre's favorite. I received a free copy of this book from the publisher in exchange for an honest review. This does not affect in any way my opinion on the book. Pierre Lemaitre was born in Paris in 1951. He worked for many years as a teacher of literature before becoming a novelist. He was awarded the Crime Writers' Association International Dagger, alongside Fred Vargas, for Alex, and as sole winner for Camille, The Great Swindle and for Blood Wedding in 2016. In 2013 his novel Au revoir là-haut (The Great Swindle, in English translation) won the Prix Goncourt, France's leading literary award. Buy on Amazon Blood Wedding and Camilla Verhoeven Trilogy.